The USB-8COMi-RM USB-to-Octal RS-232/422/485 Serial Adapter is designed to make serial port expansion quick and simple. Connecting to a USB port on your computer or USB hub, the USB Serial Adapter instantly adds eight RS-232, or RS-422, or RS-485 serial communication ports to your system. By taking advantage of the USB bus, the USB Serial Adapter makes it easier than ever to add serial ports and serial devices to your system with easy plug-and-play and hot plug features. By plugging the USB Serial Adapter to the USB port, the adapter is automatically detected and installed. There are no IRQ & COM port conflicts, since the ports do not require any additional IRQ, DMA, memory as resources on the system. The adapter is self-powered, and has built-in switching power supply of 100V/240V (input) inside the chassis. The adapter is designed with eight external 4-pin dip switches to set RS-232, RS-422or RS-485 mode conveniently, without the need to open the metal chassis. Each port can be independently set to RS-232, RS-422, or RS-485, depending on your requirement in application. The adapter is with DIN rail bracket for industrial environment. The adapter can be also mounted to a 19 rack, and the rack mount kits are included with the adapter. Termination and biasing option are available for data transmission lines. The USB-to-Octal RS-232/422/485 Adapter provides instant connectivity to RS-232, RS-422, RS-485 communication devices for POS, factory automation equipment, multi-drop data collection devices, bar code readers, time clocks, scales, data entry terminals, PC to PC long distance communications, ATMs and serial communication in harsh environments. 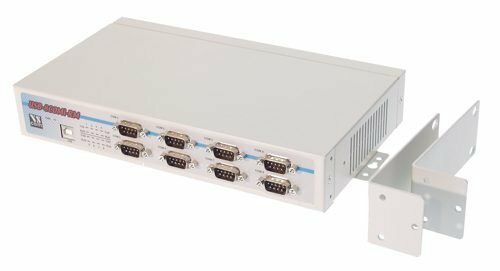 The USB-8COMi-RM USB to Industrial I/O provides industrial solution requiring single node or multi-drop communications over short and long distance. If you have any questions about this product by SERIALGEAR, contact us by completing and submitting the form below. If you are looking for a specif part number, please include it with your message.